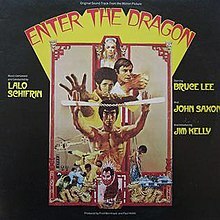 "Enter the Dragon" is a soundtrack album to the motion picture of the same name by Argentine composer, pianist and conductor Lalo Schifrin recorded in 1973 and released on the Warner Bros. label. The Allmusic review states "The opening "Theme from Enter the Dragon" is unquestionably a product of its time. While the tune is occasionally infused with Eastern-sounding chords and instrumental voicings, the adrenaline-pumping proto-funk backbeat is drenched in wah-wah guitar, dramatic brass interjections and (presumably) Lee's intimidating Kiai (battle cry) vocalizations. With the notable exception of the reprise of the "Theme From...," the remaining eight selections primarily consist of mood-enhancing sounds to accompany rather than react to -- the action taking place on screen". All tracks written by Lalo Schifrin. UK Warner Bros. K 46275 stereo (1973). Album produced by Rick Redman. The album cover has a strong, undamaged spine, displating very clear, printed script.